On Jan. 22-23, instructors and directors of the voting membership of Drum Corps International will meet in Indianapolis to discuss eight new rule proposals as part of the annual DCI winter business meetings. DCI.org columnist Michael Boo breaks down each of the items that will be considered and gives his insight and opinions on how passage of each rule might affect the direction of the drum corps activity. Read part I of this series. Change Time of Entry and Warm Up (Pre-Show). Carolina Crown takes the field at the '09 Quarterfinals. This is another proposal from the Cadets' George Hopkins; one that would influence the way the audience perceives the entertainment value of shows. Under current rules, there are 17-minute blocks allotted for each corps' production including setup and actual performance time. Under this proposal, each corps would be given 18 minutes, with the first three of those minutes used to enter the field and set up equipment for the performance. Now here's where things get interesting: Each corps would then have three minutes to warm up and/or move around the field, using ANY device they wish, including recorded music and any legal or illegal instruments. 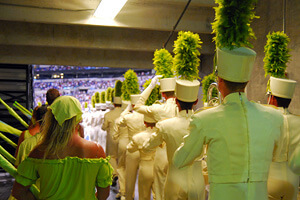 After the six minutes total of setup and "pre-show," the corps would then have up to 12 minutes to perform its judged show. Hopkins points out, "More time is needed to set up the performers and equipment, (especially the electronics)." In addition, "This 'warm-up' and pre-show will allow the corps to be more creative in their approach to the time allocated," making the entire production "more interesting to the audience." It's hard to argue that this type of pre-show wouldn't be more entertaining to the audience, as we've already seen it happen in previous years, like Phantom Regiment's Roman Legionnaire entrance during their '08 Championship-winning production. Anything that provides "value added" to the fans is bound to be met with positive feedback. Granted, some may view this as a further departure from traditional drum corps performances, while others may think more along the lines of, "Who cares? Anything that results in us seeing more drum corps is a good thing." ces from start to finish with their '08 'Spartacus' production. One question that perhaps needs to be pondered is what would happen to corps that choose to use the six minutes to set up for their performances without doing a pre-show? Going into more detail on the proposal, Hopkins notes that beginning at the 3:01 time mark, the pre-show section, "will be viewed by the General Effect judges as the fans view. There is no evaluation of the material, but in terms of setting a mood or a stage, all would be considered." It's possible that judges are already influenced by the effect of the "running starts" we've seen over the last few years. But even if this opening section as proposed is not mandatory, will an impression be created in the eyes of the judges that the corps who do not do a pre-show have a less creative production? Will knowing that the General Effect judges are looking on during this time period, even if they are not commenting, result in a de facto requirement that all corps do a pre-show so none have a scoring advantage before the bulk of the performance even starts? Not that it's hidden at all in the proposal, but Hopkins lists that during this pre-show, corps may use any device, taped music and/or any instrumentation. When corps directors and staff meet this week in Indianapolis it may need to be clarified as to what the word "any" means. In the past, Hopkins has proposed the use of saxophones and other instruments on the drum corps field, but he's not asking that those instruments be allowed within the portion of a show that is currently judged. What could "any device" be interpreted to include? Light shows? Acts including people who are not members of the corps? (Remember the fire truck lights and sirens after the Cadets' Finals performance in Madison in 2002? Or how about a celebrity guest soloist ala the band competition in the movie "Drumline"?) 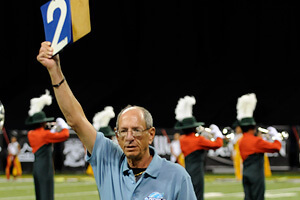 Overall it seems Hopkins, as he has many times in the past, is offering this rule to continue to push the creative boundaries of drum corps programming; but with this one daring to be different without entirely upending the idea of what fans have come to expect when they show up at the stadium for a show. In his concluding notes on this proposal Hopkins says, "… as we look to be new, as we try to be different … allowing freedom of expression is possible without altering the competitive landscape." The possibilities with this one are limitless, and I suspect that by the end of the upcoming meetings in Indianapolis, there will be a few clarifications added before this proposal is or is not passed. Modification of Entry and Warm Up Time. of the performing corps' warm-up time. DCI Contest Director Tony DiCarlo is offering a proposal similar to the one above. His proposal would in effect simply fix the rule book to reflect how field entries and warm-ups have been handled the past couple of years; a five-minute period prior to the judged performance, with each corps deciding how to use that time. DiCarlo notes that this would "give each corps more flexibility during this period" and would "allow the corps to use this period of time creatively," making the "period of time prior to the show more entertaining" for the audience. Under this proposal, judging will proceed as before, once the five minutes is up. While the Hopkins proposal opens up unlimited possibilities (and to those who might oppose it, perhaps a bottomless can of worms), the DiCarlo proposal is elegant in its simplicity. However, it wouldn't change what is already allowed, as it is a clarification of existing procedures. I expect that the more intriguing Hopkins proposal will garner the most discussion, and the final proposal to be voted upon will be a hybrid of the two. Coming tomorrow: Part III of the 2010 Rules Change series look at what changes might be in store for how the corps are judged.